Whether you are brand new to the art of sewing or you have years of experience, we all need a little help with certain projects from time to time, which is why I have assembled my own personal set of useful sewing tips and tricks which can help both beginners, experienced enthusiasts and pros to make their projects look even more professional and good. When you are starting a new project, it is always a good idea to start all the first stitches with the help of the hand wheel of your sewing machine. This will help better define where they are placed on your fabric, and will allow you to make all necessary adjustments to the form and direction of your stitching before you have gone too far and made a mistake with the sewing. This is especially useful if you are working with tougher fabric or with multiple layers of fabric for your new project. By starting off the new stitches with the help of the hand wheel you will make sure that the thread is sewing correctly and that it doesn’t jam halfway through the stitch. Sure, disappearing markers are an excellent option for outlining your design and making all necessary markings for your new project on your fabric, but chances are that you may lose all those valuable marks if you happen to leave behind your current project due to other errands and work which may come up. This is why, I highly recommend that you skip the marker and use scotch magic tape instead. It is easy to use and will keep all your marks visible for as long as you need. Once you remove the tape and begin sewing, all leftover markings will quickly disappear and the fabric will remain unharmed. If you notice that your machine is making stitches which are too tight, too loose, or simply wrong, go ahead and re-thread the spool and the bobbin. Yes, it may be a little tiresome to re-thread everything, but by doing this you can fix quite a few possible issues without risking to ruin your current project and without needing to call a costly repair service! Even if it doesn’t resolve the problems, it is still worth giving it a try before heading off to the repair shop! Scrap fabric can seem like a nuisance and unnecessary item to keep but I strongly advise that you keep the larger fabric scraps so that you can use them for stitching practice for one of your next sewing projects. These seemingly needless pieces of fabric will come in handy next time you are trying out a new stitch or pattern, so make sure you throw them in your scrap box or basket instead of the bin. Yes, top-stitching can be quite a nuisance, but with the help of some masking tape you can easily create a guide to help you follow the straight lines of your design. Stick a piece of tape along the lines of your new project and then just go ahead and add the stitches along the side of the tape. Magic tape is an absolute must for placing guidelines on your fabric without risking damaging it with permanent markings. You may feel tempted to lift the needle when you are stitching a corner on the cloth in order to reposition it properly, but the truth is that by keeping the needle down, you can create a perfect stitch at the corner and go on with your sewing. Move the fabric at 90 degrees without lifting the needle of your sewing machine and go ahead and continue with your stitching. You will end up with much straighter corners and will avoid the crooked and messy look which sometimes can happen when you move the fabric too much. Here is a quick video because, you know a visual is worth a thousand words.. Even if it does involve some more time and energy, it is highly recommended that you iron the seams as you go ahead with your project. This will help smooth the thread and seams and allow it to disappear in the fabric. Pressing the fabric on your ironing board will also remove any thread puckering which often can occur when you are sewing. Once you learn how to properly press the seams and do so each time your pattern instruction require it – you will find that your project will start looking better, more professional and that in the end it will bring you much more satisfaction. As with everything else in life – the key to stitching is having the patience and taking the time to perform a proper cutting, designing and sewing job. Hurrying will cause you to make mistakes, wrong stitches as well as lead to causing permanent damage to your fabric and your entire project. 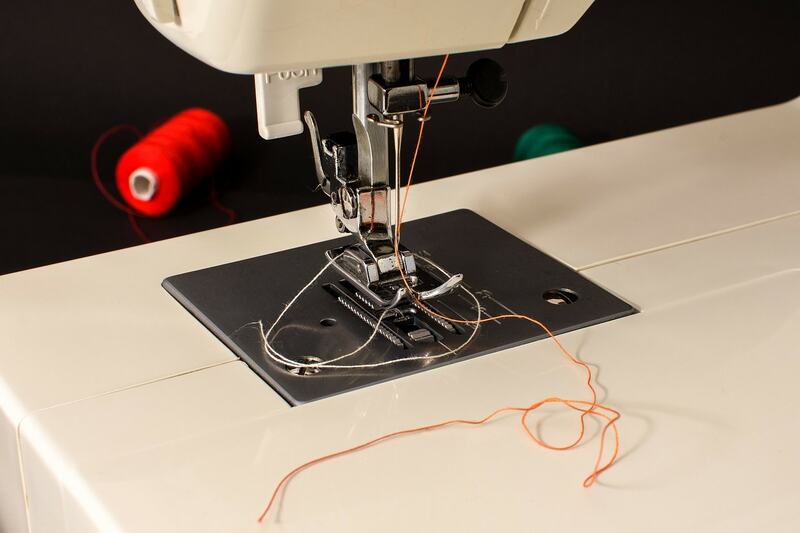 Even a simple sewing machine designed for beginners may offer fast stitching options, so choose a pace which is comfortable enough for you, so that you are in perfect control of the project at all times. Yes, buying a high quality sewing machine can be quite an investment, but in the long run you will find that your sewing is better and that the fabrics and projects which you need to salvage due to mistakes in the stitching are reduced to a minimum. This is essential especially if you are a new seamstress. Modern sewing machines have automatic functions and can help you perform some unnerving tasks such as: cutting, bobbin winding and needle threading. A high quality machine can also help you with easy speed adjustment and much easier and more comfortable hand or foot control. In case you are still not sure that the new hobby of sewing will stick, you should borrow a sewing machine from a friend and give it a try first before proceeding to purchase one for yourself (check this page if you want to buy one right away). A good quality sewing machine which has durable metal parts and a metal chassis will last and serve you well for much longer, so make sure you invest wisely if you want to enjoy your new hobby for longer. Even the highest quality, modern sewing machines need proper maintenance if you want to achieve the best results and if you want to reduce the risk of damage to both the machine and your sewing projects in the future. This is why, you should make sure that you take the time to clean and oil your machine periodically. Read the manual provided by the manufacturer and follow the maintenance instructions closely. If you are an experienced seamstress or a professional, you probably already follow the rule of using a new needle each time you start a new project. By ensuring that the needle is sharp and in good shape, you will make sure that your project goes well, your stitches are straight and proper and that you minimize the risk of damaging the fabric as you work. It is recommended to use the most appropriate needle for the type of fabric you are working with in order to get the best results. Smaller needles should be used when you are working with delicate fabrics, while for medium weight and heavy fabrics, you should install a larger sized needle. Make sure you keep an eye on the condition of your needle and replace it immediately if you notice that it is damaging your fabric or is having difficulties performing as well as you expect. By taking the time to wash the fabric and press it properly before beginning a new project you will help avoid the annoying puckering, and also will make your sewing much easier and better especially if you are working with several different types of fabric for your project. Keep in mind that the different types of fabric will shrink at different rates when washed, so preshrink them in advance to avoid the damage to your garment which can often occur after you wash it for the first time after it is ready. By pressing the fabric you are using, you will ensure that the marking, cutting and sewing processes are much easier and more precise. The smoother the fabric is – the easier and more enjoyable the sewing process will be. This is essential, especially if you are a beginner. Starting with a simple project rather than jumping into a complicated one will minimize the risk of failure, frustration and the loss of motivation. Choose a simple project and try out which kind of sewing, design and cutting you feel most comfortable with. Once you get a hang of it, you will feel much more satisfaction and will find that you are ready to take up a more complicated project in the future.